Add your photographs to Artistic Photoz! Have some photographs you want to put online? Want to sell your photographs online? You can for free at ArtisticPhotoz.com! For more information, contact us! You may have noticed that we recently updated our look and feel. We hope you like it. Our new design will enable us to offer you more scenic nature photography and photographic equipment than ever before! 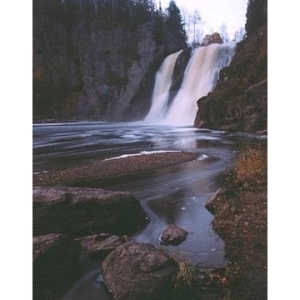 Whether you're looking for minnesota waterfalls, beautiful nature pictures from northern minnesota, photographs of streams, rivers, lakes or other subjects, you'll find it here. Now you can easily browse through our artists to find nature photographs and scenic photographs. You can also contact us if you'd like to offer your photographs for sale! Nestled about an hour drive north of Duluth Minnesota sits the quiet and peacefull Tettegouche State park. This photograph of the lower falls shows the beautiful browns and tans of late autumn in northern Minnesota. Relaxing and calming, this is photograph is one of my personal favorites.